Today, Thailand goes to the polls in the long-awaited first democratic elections for 500 lower house seats since the 2014 military coup. The main pro-regime party, the Palang Pracharath Party (PPP) of the incumbent military PM, General Prayut Chan-o-cha, has promised minimum wage increases and minimum agricultural prices for farmers. In addition, it has proposed a set minimum salary for new graduates, likely targeting the 7 million young new voters in this election. The agricultural policies in particular may be an attempt to capitalise on the waning fortunes of the main anti-Junta party, Pheu Thai, founded by ousted PM Thaksin Shinawatra, whose main support base was the rural north of the country. 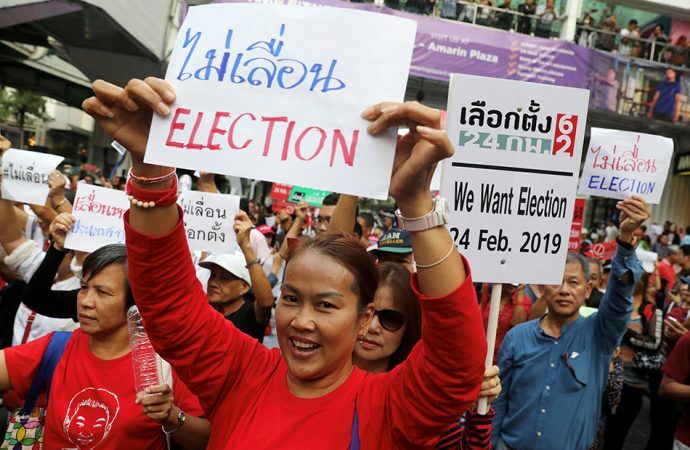 An electoral disqualification for its sister-party has resulted in Pheu Thai now contesting only 250-seats in the 500-seat lower house of parliament; the party cannot win a majority by itself. The election looked set for a Pheu Thai bloc win but is now up for grabs, with the pro-Junta parties right in the running to form a coalition government. However, regardless of which party is able to win the lion’s share of votes, the 250-seat regime-appointed Senate will have 50% of the votes for the parliamentary-appointed Prime Minister. These inbuilt mechanisms in the post-Junta political system will prevent a truly democratic government free from military influence.